Crocs, which Ms. Way had identified with a hashtag, pulled the snapshot from Instagramand featured it in a gallery of user-generated photographs on its website. The company had not asked Ms. Way for permission, and she was not aware that Crocs had used the photo until a reporter contacted her on Instagram. Much later, Crocs sought her permission. Instagram and other social sites like Pinterest and Twitter have long been sources of selfies and candid shots that retailers and other companies mine for “consumer engagement,” a broad industry term that can mean anything from Facebook likes to hashtags for brands. But as the practice of promoting user-generated content has intensified, the intersection between brands trying to capitalize on social media activity and people’s expectations of some privacy (even as they post personal photos on public platforms like Instagram) has grown far more murky. No one, it seems, wants to actively police traditional rights issues like those presented in Ms. Way’s situation. Using photos like her daughter’s generally requires getting the consent of the person who posted the original content before it can be reused elsewhere. For its part, Instagram, which has about 300 million users, says it is responsible only for how brands use consumers’ photos posted on its site. The lack of oversight comes at a time when brands and social media sites are strengthening their relationships in efforts to generate ad revenue and lock in loyal consumers. Instagram, in particular, has been working to open its photo feed to all advertisers, big and small, across the globe. Privacy groups and consumer advocates continue to voice concerns about how companies use data culled from social media to endorse or sell products. In 2012, Facebook, which owns Instagram, reached a settlement in a class-action lawsuit over its “sponsored stories,” or its practice of turning a users’ likes into ads tailored to their friends. The court approved the settlement in 2013, but it is currently being appealed. Still, in the age of the selfie, many users enjoy getting a broader audience for the photos, opinions and tastes they share online. I’m always really excited,” said Liza Day Penney, a 23-year-old from Dayton, Tenn., whose photo appears on American Eagle Outfitter’s website. She estimated that the company has used more than half-a-dozen of her photos, and even once sent her a $25 gift card. In many cases, getting consent from a user can be as casual as a comment underneath the photo itself. “We love your pic!” the Crocs Instagram account writes on many of the user-generated snapshots featured on its website, followed by a request to feature the photo elsewhere. To agree, users just have to reply with “#CrocsOk,” and many do. 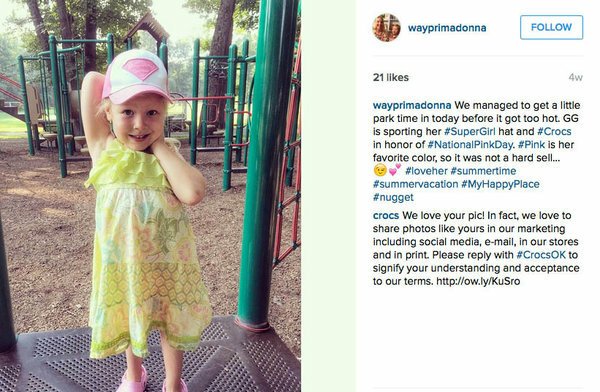 In the case of Ms. Way, however, Crocs did not comment on the photo to ask for permission until after posting it on its website. Ms. Way has not responded and says she does not intend to. The tactic is particularly popular among apparel companies, as they rethink how to maintain customer loyalty in the digital age. “There’s a significant risk of us losing that relationship with the customer and that bond you get from the experience in the store,” said Joe Megibow, the chief digital officer at American Eagle, which has galleries of consumers’ photos on its website. Mr. Megibow said American Eagle, which works with Olapic, monitors Twitter and Instagram for photos that users have identified with the hashtag #AEOstyle or #AerieReal. Olapic is a marketing company that helps brands collect users’ photos.